Brantford Single-Handle Pull-Out Sprayer Kitchen Faucet With Reflex In Oil Rubbed Bronze Brantford kitchen and bar/prep faucets make a traditionally styled space feel truly finished. The spout enhances the curvature of the faucet body and handle for a beautiful, polished look. 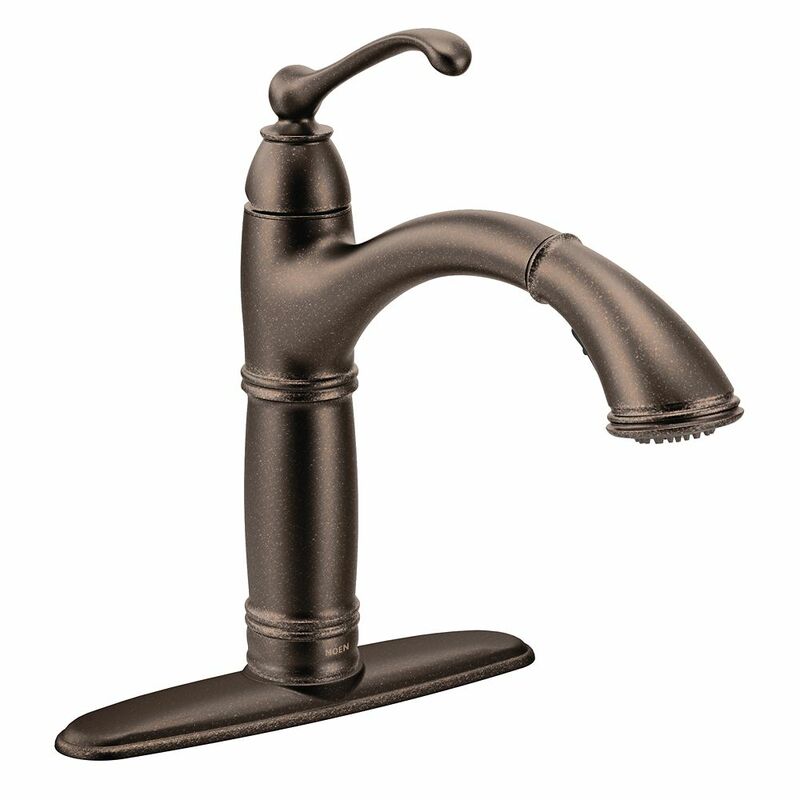 Brantford Single-Handle Pull-Out Sprayer Kitchen Faucet With Reflex In Oil Rubbed Bronze is rated 4.5 out of 5 by 20. Rated 5 out of 5 by DaddyDave55 from This faucet is well made and the finish (oil rubbed bronze) is very nice. The Power Clean featur... This faucet is well made and the finish (oil rubbed bronze) is very nice. The Power Clean feature is worth considering if spraying dirty plates and pans is something you do often. Rated 5 out of 5 by Helen from This faucet is beautiful and seems to be built very... This faucet is beautiful and seems to be built very well. Looks great in our new kitchen. Rated 4 out of 5 by Anna from We bought this to replace our kitchen faucet that started... We bought this to replace our kitchen faucet that started to leak. Overall, very happy with my purchase. It's a beautiful faucet that goes with the rest of our kitchen color scheme. The handle is easy to use, and while it's taller than the faucet we had previously, I really like the extra vertical space in the sink when washing dishes or filling a pot with water. The end piece is plastic, not metal, but you really can't tell and this is the case with many faucets these days. Recommend this! Rated 5 out of 5 by John from Installation was straight forward but did take over an hour... Installation was straight forward but did take over an hour including removing the old faucet. Faucet works very well, but the pull-out handle is made out of a light plastic to keep from damaging sink or handle if it is dropped into the sink. I wish the handle were heavier but not a big deal. Rated 5 out of 5 by Terri from This faucet is taller than it looks in the photo,... This faucet is taller than it looks in the photo, which makes it very dramatic. The oil-rubbed bronze color is lovely. Having the handle on the top is convenient, and everything functions well. It has the rustic look of an old-fashioned pump. If you want a “statement” faucet, this is it! Rated 5 out of 5 by Connie from I bought this to replace a much smaller faucet for... I bought this to replace a much smaller faucet for a mid size island sink. At first I thought maybe it was going to be too big for the sink and area. But after just one day I fell in love with it. I realized having a faucet a little bit higher is a huge advantage. Love the color, too!